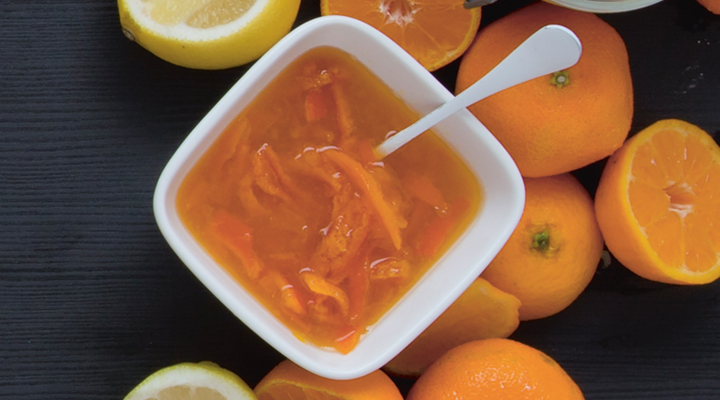 This marmalade makes a unique gift during winter months. It’s full of flavour and will bring some sunshine to anyone’s morning toast. *This recipe makes 6 jars. 1. Wash the clementines in warm water, then dry with a clean tea towel. Cut around the stem of the clementines and pull out the fibrous core. Slice and chop the clementines to your preferred chunkiness and place in a heavy-bottomed pot. Save any pips. 2. Place the clementine and lemon pips in a muslin square or empty teabag and tie to the pot handle so that it sits inside. The pips contain pectin, which is what makes the marmalade set. 3. Top up the clementines in the pot with the lemon juice and water and bring to the boil, then lower the heat and simmer for about 1 hour 30 minutes, until the clementine peel is tender. Remove the parcel of pips, squeezing its juice into the pot, and discard. 4. Add the sugar to the clementines and stir until it is completely dissolved, then bring the mixture back to the boil again. Continue cooking for 5 to 10 minutes, until a sugar thermometer reads 105°C. If you don’t have a sugar thermometer, use the wrinkle test: place a teaspoonful of the marmalade on a cold saucer straight from the fridge or freezer and let it sit for 1 minute, then push your finger through it. If the surface of the marmalade wrinkles, it’s set. 5. Remove from the heat and cool for 5 minutes, then pour into your warm sterilised jars. Place a disc of wax paper on the marmalade, with the wax side touching the marmalade, and seal with cellophane circles and rubber bands. TIP: You will need a sugar thermometer, 6 medium-sized sterilised jam jars, wax paper, cellophane discs and rubber bands.